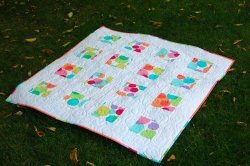 "We love the simplicity of this quilt. Choose a lively Focus Fabric and a high contrast background or make the contrast more subtle. The choice is yours! Please note the background Fabric should be non-directional.